The first round began with Alex Taubman in fine form beating Tony Kinsella 3-1 with breaks of 52, 90 and 76. Robert Marshall could not repeat his fine form from the Lancaster event losing easily 0-3 to Leo Fernandez. Leo made breaks of 39, 44 and 49. Clayton Humphries had a comfortable 3-1 win over Jack Bradford, finishing off with a 73 break. Junior player Paul Deaville continues to improve, winning the first frame against Mark Salmon on the black, then recording an 80 break in the next frame before wrapping up the match 3-0. Andy Milliard had a titanic battle with David Holcroft. David made an 86 break to level the match at 2-2. However, Andy replied in the decider with 82. 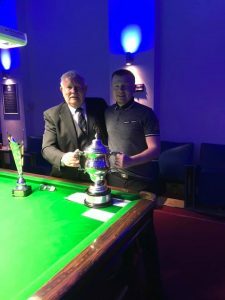 In the remaining matches, Simon Blackwell beat Jamie Jones 3-0, Sean Maddocks beat Jason Tart 3-1 and Mike Nixon received a walk-over with the non-attendance of Danny Hicks. The first quarter-final was a cat and mouse affair, with Alex Taubman taking the opening frame. Leo Fernandez levelled with 33 and 36. Alex again took the lead, aided by a 48 break. Leo dominated the fourth frame with a top break of 38. Alex at last produced his best form and took the decider with a 68 break. Paul Deaville continued his fine form, defeating Clayton Humphries 3-1. Paul had a top break of 55, while in the only frame Clayton won, he made an 80 break. Andy Milliard started off well against Simon Blackwell, winning the first frame with a 50. From then on, it was downhill as Simon won the next three. Sean Maddocks played out a marathon match against Mike Nixon. Sean established a 2-1 lead before Mike hit back with a 56 break. The decider was a very tense affair with Sean trailing for most of the frame before snookering Mike on the blue and eventually potting the pink for the game. The semi-final produced straight forward wins for Taubnan over Deaville, three nil and Blackwell over Maddocks, three one. The final started with Taubman taking the first frame with the aid of a thirty nine break. 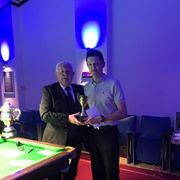 There then followed an exhibition of consistent power potting by Blackwell who reeled off the next four frames in style to take the magnificent silver trophy, on loan from Thurston’s museum, a replica trophy and the five hundred pound winners cheque. Alex received a cheque for two hundred and fifty pounds and a trophy. Robert Marshall had the highest break of one hundred and nineteen, worth fifty pounds. John Twist refereed the final stages and received a commemorative medal. Report submitted by Eddie Fielding. Lancaster qualifier hailed as a great success!